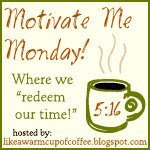 It's Motivate Me Monday over at Like a Warm Cup of Coffee. WELL, I just stopped by over there and maybe there won't be a MMM post, but it sure is a great Monday! Sarah Mae had her baby girl Saturday night!! Congratulations and many blessings!!! :) Please stop by her place and tell her congrats! I feel motivated lately by the idea of simplicity. It has been coming up again and again. I've seen many a blogger taking a break, scaling back, or trying to find balance with real life. 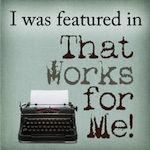 I just talked to my hubby a couple of days ago (I am so blessed that he does not want me to stop blogging!) and he suggested that perhaps I am overdoing it a bit on my blog. What that means is that my household is still not in order - hubby kindly puts up with my housecleaning/organizing issues while hoping for better days ahead - and the behind-the-scenes time that I put in for my blog eats into the household-running time. I'm not talking about daily posting. I'm talking about baking things late at night just to get a photo for a post or the time spent putting together a giveaway and especially the hours it takes for me to put together my theme weeks. Don't get me wrong - I LOVE doing all those things because I want my blog to be fabulous and fun! But when I put all my effort into those things, I neglect my household. I need to simplify things. Of course I am all about simplifying my household - it's not all that complicated anyway. But right now, I need to simplify things a bit with my blog so I can focus on my household and be a blessing to my family. I'm not going anywhere - I will still be posting Monday thru Friday and reading blogs and commenting as I have time (and an occasional "tweet" or two!). Right now, I'm just scaling back on some of the plans that I had for my blog over the next couple of months. I really wanted to host a virtual girls' night this month - sorry, just can't do it. And I had planned another theme week for March (a week of cakes - yum! ), but I will have to postpone that. I still want to do it, but it will have to wait until late April or even May. But that just gives you more time to get some cake recipes gathered to link up! 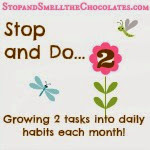 I will be having my 1-year blogaversary in April, so that will be a fun day and will probably involve chocolate - LOL! Whew - I feel a bit of relief in that. Watch out - I will be on the hunt for as much good info on household systems and organizing as I can find - and may even come up with a way to post about my progress to help myself with accountability. I also ask for your prayers - I really want to be the best homemaker I can be (I'll never be perfect!) and I am capable of so much better! Thanks for letting me ramble a bit! What's motivating you today? Oh I feel relief just reading your post! I'm with you. I don't plan on doing anything to time consuming with my blog. No more theme weeks for awhile or anything. I will of course continue to do the Friday Funnies and Saturday Show and Tells but they don't eat up any more time then posting a regular post. It's funny because my blog really is mostly posts about stuff that I want to remember myself but it seems to entertain the masses as well LOL. I have a surprise for you on my blog tomorrow. I'll give you a hint about what I'm writing about. It starts with a T.
Do I get extra credits for an extremely LONG post! LOL. This should count for 2 extra top commentator points! LOL. Wonderful post! I've ended up cutting my blog time into 30 minute increments . . . 30 minutes every two hours or so. Then I can keep focussed on my housework for a few hours at a time, and can reward myself with a blog break. ;) Have you heard of the Flylady. She's done a lot for my simplifying and organizing. I am so with you. As much as I love blogging, I don't want my whole life revolving around a computer. It is nearly spring, and I want/need to get up and get out so much more. I need to be working on my photography and making updates to this old house. So I so understand what you are talking about. This has been one of the best things in my life, meeting so many new and nice people. Pulled me through the year of my retirement and gave me something to do. I love that. But now I want to move on to a new project. Like you, I will always blog and check up on people, but it will not consume me. I acually read the Sunday paper yesterday with my husband....haven't done that in months! I actually scaled back my posting and released myself from the self imposed 'thing' of posting daily. I found that I wanted whatever I posted to be better instead of just putting something out there. Anyways... I totally get what you're saying and can appreciate where you are coming from. Now, whenever you want to come get busy on my house, you are welcome! Amen sister! the toughest part is the feeling that it's an obligation instead of just sharing our lives. if i can keep that perspective of simply sharing what's going on in our lives instead of trying to keep others entertained or coming back for more, then it's a lot less stressful and more enjoyable. Be blessed. Blogging sure can get addicting that's for sure. I too have to be careful so that I don't neglect other things (C: I've actually had no internet access at my house for almost 3 weeks and it's been a bummer to not be able to blog or visit as much as I'd like. Lisa, I am sure that with the guidance and direction of the Lord, you will find the right balance for yourself and your family. 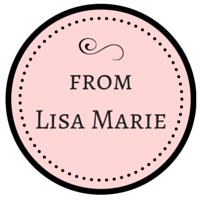 I will enjoy keeping up with your blog whether it be daily, weekly or even monthly. I appreciate your transparency.